Blue and white has always been an important color combination in decorative art, particularly porcelain. The early Chinese "blue and white wares" painted with cobalt oxide have influenced many European imitations since Chinoiserie became popular in the late 17th century. 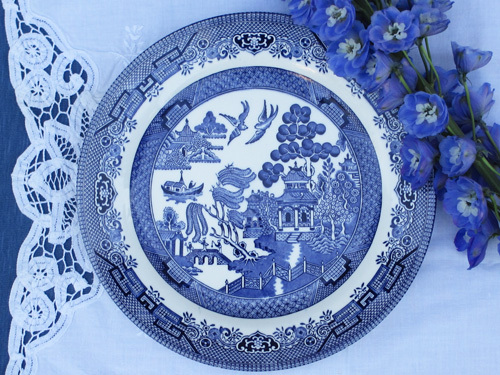 One of my favorites is the Blue Willow pattern made in England. Originally credited to an engraver by the name of Thomas Minton, the design has been popular since its creation in 1790. Today, there are many different versions of this transferware pattern produced by various manufacturers worldwide including Spode and Wedgewood. A love story is associated with the imagery on this plate. According to the legend, the daughter of a wealthy Mandarin fell in love with her father's secretary. They would meet secretly under a willow tree. She was promised to marry an elderly nobleman so the two young lovers ran away. The Mandarin sent his soldiers after them and they killed his daughter's lover. Realizing her beloved was dead, she set herself and her house on fire. Two lovebirds then rose out of the ashes and reside in the sky above the weeping willow tree. In decor, the crisp elegance of Blue Willow ware is highlighted by a substantial and bright complement. 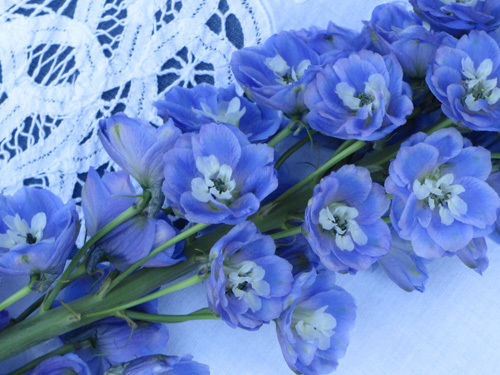 The naturally cobalt coloration of the delphinium is somewhat unusual to find in a flower. 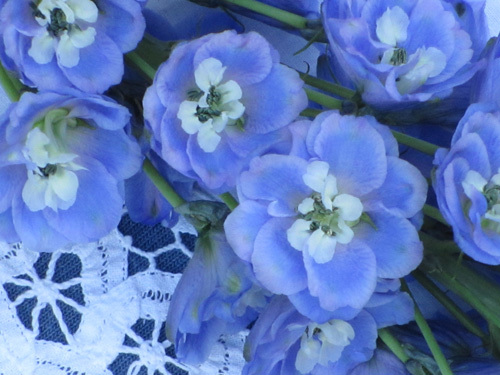 Vases filled with such bursts of blue would enhance a table set in Blue Willow ware. Isn't the color of the petals spectacular?